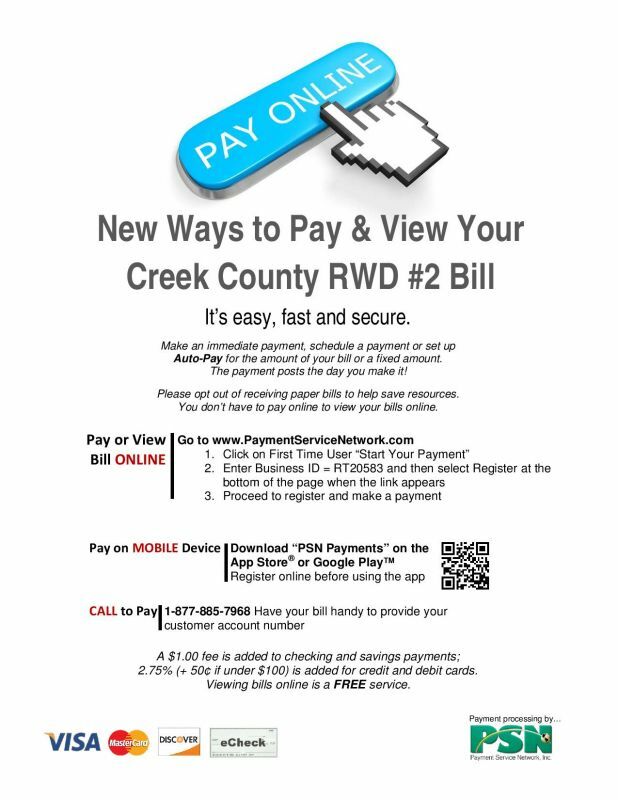 Creek County Rural Water District 2 offers a wide variety of convenient payment options for our customers. Simply choose the option that best suits your needs. Payments made to restore service MUST INCLUDE $50.00 SHUT OFF FEE and PREVIOUS BALANCE. All payments are due on the the first of the month and are considered late on the 17th. Any previous balance that remains unpaid on the first of the following month will cause your water to be disconnected. You may pay your bill in person at our office address. We accept cash, check, or money orders. To avoid longer wait times, please note that Mondays, Fridays and the first day after a holiday are normally very busy. We also have a night drop box for after hours payment on the east side of our office. Online Bill Pay is Here!